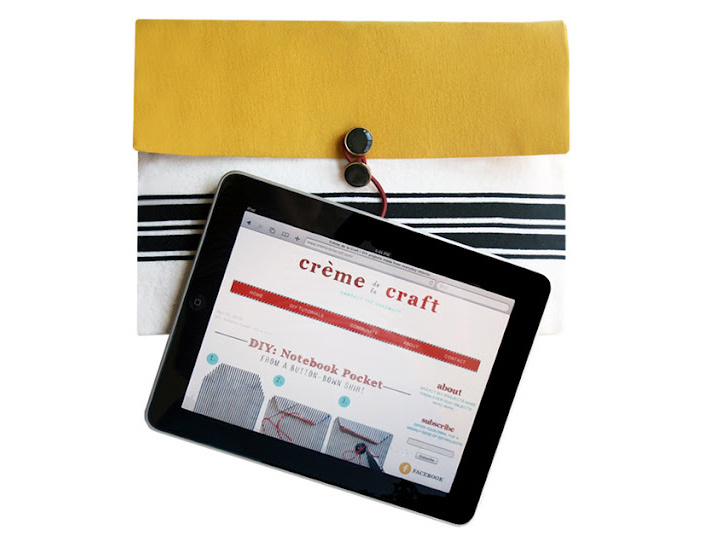 Make a super stylish iPad (or Nook, or Kindle) case from a recycled bubble envelope by following these easy DIY instructions via Creme de la Craft! A bubble mailer becomes the perfect object to upcycle for this DIY project — not only is it the ideal size and shape for a tablet, but its very function is to protect your stuff. You can cover up the envelope with your favorite fabric for a customized look, and creating a couple more to mix things up won’t cost you much more than a little bit of your time. Check out the complete how-to instructions here. Make a super stylish iPad (or Nook, or Kindle) case from a recycled bubble envelope by following these easy DIY instructions via Creme de la Craft! A bubble mailer becomes the perfect object to upcycle for this DIY project -- not only is it the ideal size and shape for a tablet, but its very function is to protect your stuff. You can cover up the envelope with your favorite fabric for a customized look, and creating a couple more to mix things up won't cost you much more than a little bit of your time. Check out the complete how-to instructions here.